Call us at 520-269-2542 and place your order direct! 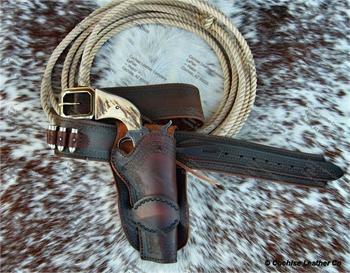 Our popular western leather gunbelt holster sets are fully lined and come in styles such as The Duke, Buscadero Rig, Mexican Loop and Slim Jim. 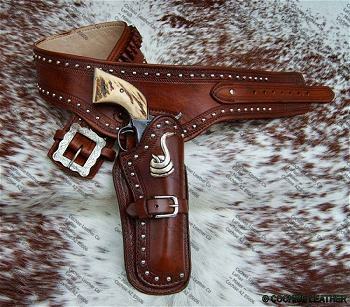 This gunleather comes in many variations and are period authentic and many are exact reproductions from the original patterns. 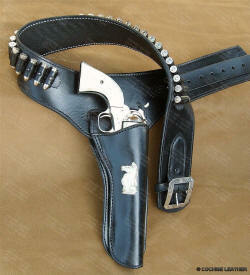 The gunbelts are 2½" wide unless otherwise noted. 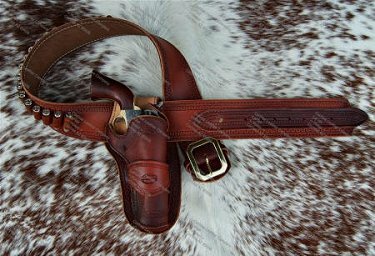 Every western gun belt and holster set is custom made and handcrafted in the USA using top quality leather from Wickett & Craig leather whose tannery is located in Pennsylvania. Founded in 1867, they are a world re-known vegetable tannery. 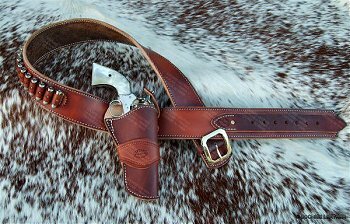 Cattle, Wickett & Craig leather and Cochise Leather equals Proudly made in the USA. 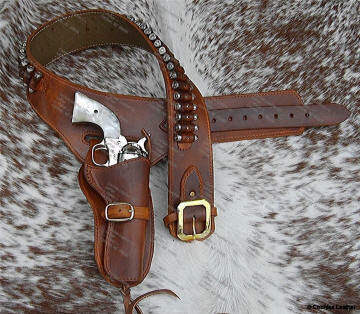 Due to popular demand we are adding many Hollywood western era gun belts. The Duke, made famous by John Wayne, The Paladin from the western TV show "Have Gun, Will Travel". Our Good Guys/Outlaw series now has the Johnny Ringo, Butch Cassidy and The Hardin. 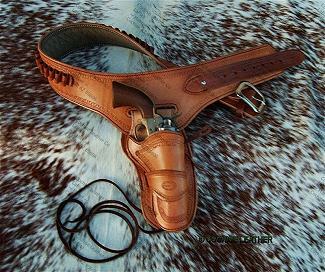 You will find these and many more made to order western gunbelts listed below. Since David LaFlair custom makes these items and he would like to extend the invitation to talk to him personally about what you would like to order. Customer satisfaction along with the quality of his product is his #1 priority! Call 520-686-2829 if you have any questions on sizes or customization. If he's not available leave a message and he'll get back to you ASAP! Place your order via our secure shopping cart with confidence or for phone orders call 520-269-2542 during our regular business hours. To check on the status of your order or general questions please email us. Note: Any gun belt 47" and over will be charged an additional $35.00 over the price shown below. All of our leather goods are handcrafted, custom made products and we take extreme care and pride in the making of them. To check on delivery status of an order email us. To check on the status of your order please email us. Please refer to our Fitting Guide when filling out the ordering information below. We make these items specifically for you ands it's very important that you take these measurements correctly. If you need help or have any questions please call 520-269-2542. Please call or email for questions, more information or if you don't see what you want. Comanchero is a Modified Mexican Loop Rig. Bordertooled with Conchos and Bleedknots. 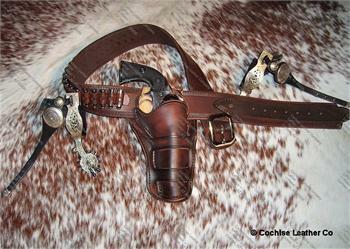 Six bullet loops on each holster and up to 18 bullet loops on gunbelt. Straight left or right only. 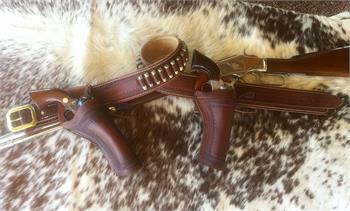 The Texan is a Mexican Loop variation with Border Tooling, Conchos and Studs. Available in straight right or left and choice of three leather colors. One of kind design with a Cochise Leather twist! 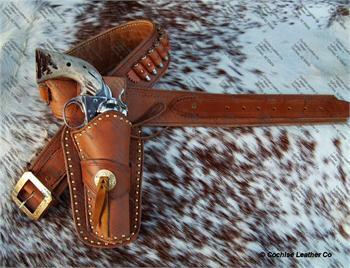 The Chaparral is fully lined w/Border Tooling, Spots and Conchos. Available in Straight or Crossdraw. Classic style available plain as shown or with border tooling. Straight Left or Straight Right. Fully Lined. 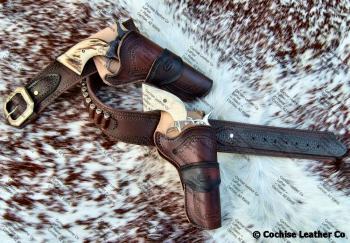 Choice of three leather colors with floral concho, border tooling and spots. Straight Left or Straight Right. Fully Lined. Fancy engraved Concho and Belt Buckle. Straight Left or Straight Right. Fully Lined. Fancy Border Tooling with choice of buckle color. Available in Straight or Crossdraw. Fully Lined. 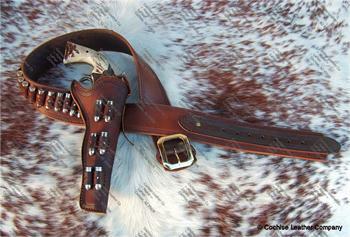 Belt width 2 1/2"
Spots with "The Mojave" Rattlesnake Concho. Available in straight right only. Available in Straight Left or Right only Fully Lined. Available Plain or as shown with Border Tooling. Belt width 2½" wide. Fully Lined with Border Tooling. Belt width 2½" wide Straight or Crossdraw. Available Border Tooled as shown or Plain. Fully Lined. Belt width 3" wide. Straight Left or Straight Right. From western TV show "Have Gun - Will Travel" Black only with Knight Chess Piece Fully Lined with Hammer Thong/Leg Tiedown. Belt width 3" wide w/silver buckle. Also available w/Sterling Silver Chess Piece and Buckle - call for pricing. NOW available in Straight and/or Crossdraw! Fully Lined with Border Tooling. Belt width 2½" wide. Border Tooled with choice of Brass or Silver Buckle. Fully Lined. Belt width 2½" wide. Additional holster available.